Myser is no stranger to the subject of water quality. Having lived on Prior Lake for 15 years, he is an avid SCUBA diver and boater and loves to spend time on the lake with his family and friends. He has been a strong advocate for protecting water quality and has been very involved in the community in a variety of capacities. 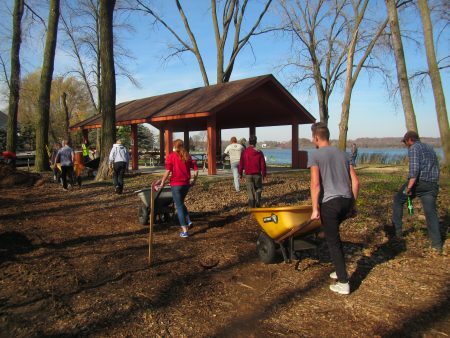 During his tenure as the Mayor of Prior Lake from 2010-2012, Myser served as the City’s liaison to PLSLWD, participating in PLSLWD’s meetings and workshops, and was an active member in Scott County Association for Leadership and Efficiency (SCALE). Myser has had a long career in business, sales and marketing. He is currently the co-owner of a technology company which develops cloud-based software solutions for companies and state agencies for energy and water conservation applications. Watershed districts are local, special-purpose units of government that work to solve and prevent water-related problems that go beyond political boundaries. The Scott County Board of Commissioners appoints individuals to serve for three-year staggered terms on the District’s Board of Managers. There are five managers on the board and they are responsible for directing the District’s policies. Lower Prior Lake is widely used as a local and regional recreational amenity, particularly for boating and fishing. In July 2013, Prior Lake-Spring Lake Watershed District wrapped up a Diagnostic and Feasibility study which determined that water quality in the majority of the lake is determined by the direct drainage from the watershed, called out untreated and undertreated areas, and identified specific projects and opportunities by subwatershed. 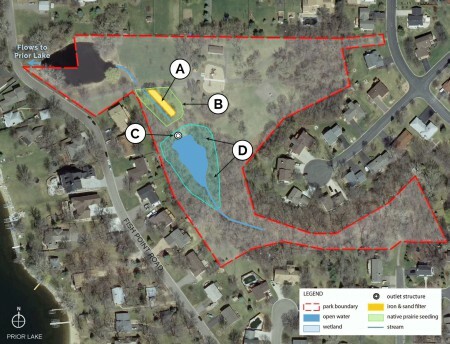 Following a neighborhood meeting held in July 2015, several changes were made to the original plans to accommodate neighbors’ feedback. The total wetland enhancement area was reduced in size which resulted in the removal of fewer trees. 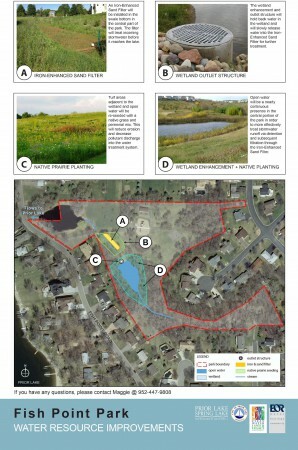 The revised plans also reduced the size of the native prairie planting area in order to retain the flat playing field area and sledding hill. In addition, some of the fill from the excavation of the ponding area was placed on the playing field but most of the fill was taken off-site to preserve the playing field and sledding hill. Lastly, the size of the ponding area was increased as a result of neighbors’ desires for a larger area of open water in the wetland. The subwatershed in which this project is located was identified as undertreated in the Diagnostic and Feasibility study. By improving the efficiency of the existing treatment train from 35% to an estimated 78%, the overall load to Lower Prior Lake would be reduced by 19 lbs, to 10lbs/year. The three elements in this project will work together to enhance their collective effectiveness, making the overall project benefits greater than the sum of the benefit provided by each part. 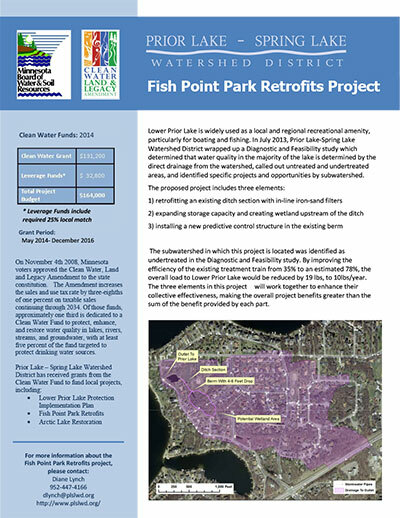 In 2015, the Watershed District finalized plans for the Fish Point Park Water Quality Improvement project. A neighborhood meeting was held in July 2015 to share the project plans with neighbors and receive their feedback. Plans were then revised to incorporate neighborhood feedback. In October, a Conservation Corps Minnesota crew began tree and brush removal at the site to prepare for the excavation of the wetland pond. Contractors then removed the remaining trees to complete the site preparation work. The wetland expansion will increase the stormwater storage capacity of the site. Crews completed the excavation of the ponding area during the first week of November. While most of the fill was removed from the site, some of the excess fill was spread on the field net to the basketball court and along the western edge of the wetland area. The installation of the outlet structures and the iron sand filter is underway and should be completed by mid-November. Multiple best management practices are in place to prevent erosion and keep sediment on site. Street sweepers are also being used to keep the road in front of the park clean. Construction should largely be complete by the end of 2015. Construction should be largely complete by December 2015. There will be a neighborhood meeting held in April 2016 to discuss the vegetation plans for the site. The vegetation plans will then be finalized and planting will occur later that spring. There will be opportunities for volunteers to help with planting so stay tuned for more details!